Health Benefits of Salmon (photo by LivligaHome). As we continue to focus on our healthy lifestyle goals, it is a good time to remind ourselves of the benefits of key foods in our diet. Designing menus with more fish is good for our health. Salmon is a particularly healthy fish. Eating it 2 to 3 times a week is the common recommendation. Good news is there are many different ways to prepare salmon for tasty meals. Check out my blog or myrecipes.com to be inspired and motivated. I have been recently introduced to Jen Reviews where you can also find out more information and recipes regarding Salmon. Here is what I found as a summary of the health benefits of salmon. It is quite a list! 2. Eating salmon makes you smarter and happier. The brain is 60 percent fat and most of that is the omega-3 fatty acid DHA. Thirty percent of the grey matter in the brain is DHA showing how critical it is to brain function and a healthy nervous system. Eating salmon regularly has been shown to reduce the risk and incidence of depression, hostility in young adults and cognitive decline in the elderly. 3. Eating salmon increases your cardiovascular health. As noted, salmon contains high levels of the omega-3 fats, EPA and DHA. These fats are responsible for many cardiovascular benefits such as reducing inflammation, keeping the blood from clotting excessively and relaxing and dilating the arteries. When eaten two to three times per week, salmon can protect you from problems such as heart attack, stroke, arrhythmia, high blood pressure and high triglycerides. 4. Salmon protects your eyes. Eating salmon twice a week has been shown to significantly decrease the risk of macular degeneration — a chronic eye condition that leads to loss of vision. For the treatment and prevention of a condition called dry eye syndrome, eat two to four servings per week. 5. Salmon helps build children’s brains. Eating salmon while pregnant and nursing can boost learning capability and academic performance in children. Salmon contains high levels of DHA (decosahexaenoic acid) which is the main structural fatty acid in the central nervous system and retina. Feeding salmon to preschool children also aids in the prevention of ADHD and can even boost academic performance. 6. Salmon’s an excellent source of vitamin D. Sufficient vitamin D is crucial to maintaining optimal health. A deficiency of this essential vitamin has been linked to an increased risk of cancer, cardiovascular disease, multiple sclerosis, rheumatoid arthritis and type-1 diabetes. One can of salmon, for example, contains a day’s worth of vitamin D.
7. Salmon helps you sleep. 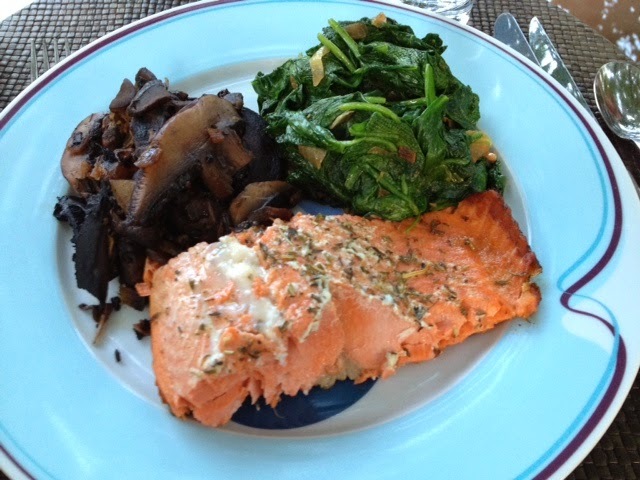 Salmon is an excellent source of tryptophan, an all-natural sedative. Studies show that tryptophan increases sleepiness in subjects with mild insomnia and helps to shorten the time it takes to fall asleep.